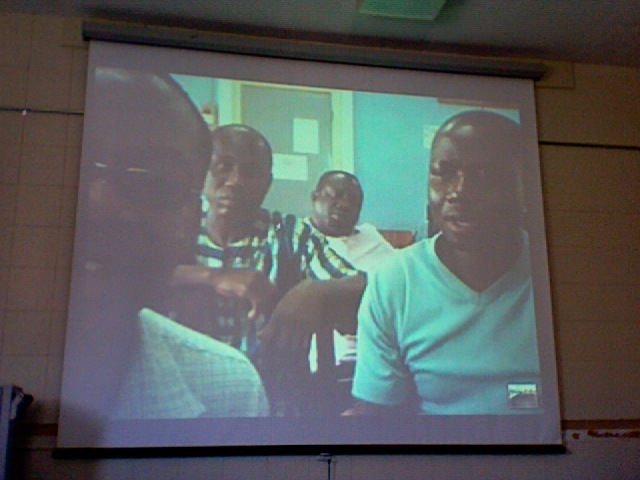 Post-midterm in one of my instructional technology classes this morning we had a Skype conference call with distance students at the University of Education in Winneba, Ghana. My instructor, Sandra Turner, was awarded a Fullbright to guest lecture and conduct research at this university during 2003-04 and has helped establish a distance program that allows experienced Ghanaian educators to earn a M.Ed in Computer Education and Technology from Ohio University. The call went well, overall – there was a considerable voice-video delay for the majority of it, but despite awful speakers the classes were able to communicate for about 20 minutes without issue. I believe that it was the first time most of my classmates had encountered Skype, and it was interesting to watch them negotiate the webcam while attempting to make themselves understood. I was not surprised to note that the Ghanaian students seemed much more comfortable with the technology – I believe that Skype voice and chat are the primary methods they use to communicate with Dr. Turner. I hope to work out a way to provide information literacy instruction to these students – they have access to electronic OU libraries resources, and I expect that using the Yugma Skype extension would work well for distance interactions. amen to open IT policies.